Echinoderms, sea urchins and sea stars in particular, are classical objects of embryological studies because it is relatively easy to obtain their gametes. Here I will describe two standard techniques used to obtain embryonic cultures of echinoids, exemplified by the sand dollar Dendraster excentricus, and asteroids, exemplified by the ochre sea star Pisaster ochraceus. 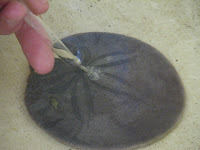 Here you can see how we collect sperm from a spawning male of the sand dollar. Injection of ~1 ml of 0.5M KCl into the body cavity of the sand dollar induces spawning by causing strong contractions of the gonad. If the specimen has ripe gonads, after a few moments gametes (sperm or eggs) begin to emerge from the five small openings called gonopores on the aboral (opposite side from the mouth) surface. Sperm is cream colored, and eggs are pink. To collect eggs, we inverted a spawning female (oral end up) over a beaker full of filtered seawater. The eggs collect at the bottom of the beaker. There are several ways to get fertilizable oocytes from sea stars. One way is to inject the body cavity with 1-methyl adenine (1-MA) solution (about 1 ml of 100 μM 1-MA in distilled water per 100 ml of body volume). 1-MA, also known as maturation-inducing substance, stimulates spawning, ovulation (release of oocytes from follicles), and oocyte maturation (completion of meiosis) in sea stars. The advantage of this method is that the adult remains intact. The disadvantage is that it will have completely spawned out, and won’t be useful for future embryological experiments for at least a few months. In order to use the same individual several times, one can take advantage of the sea star’s regenerative abilities. Instead of injecting 1-MA into the body of the intact individual, dissection of just a piece of ovary or testis is sufficient. For example, Patiria miniata, the bat star, tolerates biopsy very well, then promptly heals, so one can re-use the same individual many times. 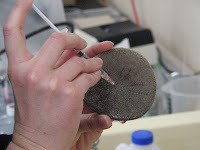 One can use a biopsy tool to cut a small window at the base of an arm, and pull a small piece of gonad out. However, some species, like Pisaster ochraceus do not heal well after biopsy, and heal much better if an entire ray is severed to remove gonads (apparently, the cutting of the radial nerve stimulates regeneration). As shown here, one can use a razor blade to cut the ray and reveal paired gonads within the body cavity. 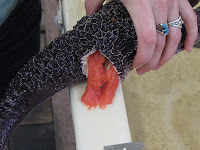 Ovaries in P. ochraceus are pink or orange-ish, while testes are creamy white. Some oocytes thus dissected complete meiosis spontaneously and can be fertilized, however, most need some help in the form of 1-MA. Incubation of dissected ovaries with 1 μM of 1-MA in filtered sea water for about an hour stimulates ovulation and oocyte maturation.